Gandhi's name was the only name discussed when 18 opposition parties met today to decide on their candidate for the vice presidential poll, sources said. 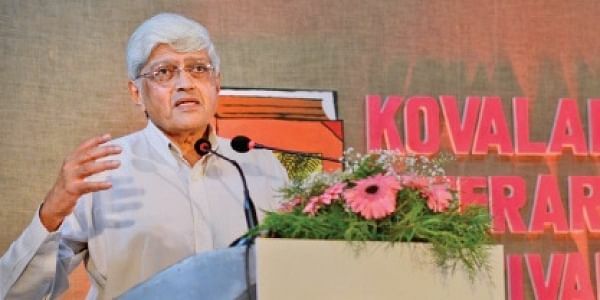 NEW DELHI: Opposition parties on Tuesday announced Gopalkrishna Gandhi, the grandson of Mahatma Gandhi, as their candidate for vice presidential election. Gandhi was the only name discussed when eighteen Opposition parties held a meeting in Parliament House to decide their candidate for the vice presidential poll. Former West Bengal governor Gopalkrishna Gandhi was informed of the decision by a call from Congress leader Ghulam Nabi Azad, TMC leader TMC’s Derek O’ Brien and CPI(M)’s Sitaram Yechury. The 72-year-old Gandhi, a retired IAS officer and diplomat, asked for 15 minutes to consult with his family before taking a decision Soon after, he called back, thanking them for their decision. His election will be interesting as Janata Dal (United) which is backing NDA’s candidate for President Ram Nath Kovind, will support Gandhi for the vice-president post. Similarly earlier, Shiv Sena supported Congress presidential candidate Pratibha Singh Patil, but went for BJP’s candidate Jaswant Singh for vice-president’s election. Incidentally, Gopalkrishna Gandhi’s maternal grandfather was C Rajagopalachari. This association of Gandhi’s with the South will make it difficult for AIADMK, who has come out in support of NDA’s presidential candidate, to come to a decision. DMK is already part of the 18 non-NDA Opposition parties. Gandhi’s name also figured for presidential candidature by the Opposition, but they finally went for Meira Kumar to counter Ram Nath Kovind. While Sharad Yadav represented the JD(U), other leaders at the meeting included Congress chief Sonia Gandhi, former Prime Minister Manmohan Singh, TMC’s Derek O’ Brien, CPI(M)’s Sitaram Yechury, NC’s Omar Abdullah, SP’s Naresh Agarwal and BSP’s Satish Chandra Mishra. Polling for the vice president’s post will take place on August 5 if required. The votes will be counted on the same evening. TMC’s O’Brien was the first to propose Gopalkrishna Gandhi’s name.